Rescuers walk near the site of the factory explosion in Yancheng. THE DEATH TOLL from an explosion at a chemical plant in eastern China has risen to 47, authorities have confirmed. The latest industrial incident to rock China in recent years occurred at around 2.50pm (6.50am Irish time yesterday) at a facility run by Tianjiayi Chemical in Yancheng, Jiangsu province, city officials said on Twitter-like Weibo. More than 600 people are currently receiving treatment for injuries sustained in the blast. The windows of houses and a school in the surrounding area were shattered by the force of the explosion, and residents were evacuated amid concerns about toxic fumes, according to authorities and images published by local media. A large blaze continued to light up the sky last night, according to AFP reporters who attempted to access the industrial area. Dozens of fire engines and ambulances — some drafted in from other cities — raced to and from the scene. Police sealed off all roads and dirt tracks to the site. An aerial view of the blast area showed a large swathe of destruction in the industrial park, where multiple fires had initially raged. Rescuers interviewed by state broadcaster CCTV repeatedly described the ground situation as “complex”, adding that the focus was on trying to pull people from the site. Emergency services continued to work throughout the night for the rescue efforts, with the initial death toll of 6 now at 47. 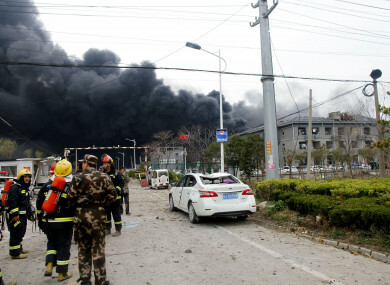 Email “Major explosion at chemical plant kills 47, injures 600 in eastern China”. Feedback on “Major explosion at chemical plant kills 47, injures 600 in eastern China”.